We wouldn’t have chocolate without flies, and seven other reasons to respect and protect these bugs that bug us, from entomologist Bryan Lessard. When most people think of flies, they think of buzzing, irritation, pests, annoyance. 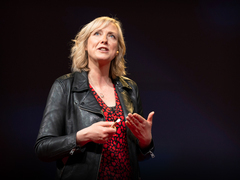 But when I think about flies — and I do constantly, as a researcher who studies them — these are some of the things that come to mind: beauty, growth, possibility and chocolate (TEDxCanberra 2016 Talk: Beauty in the beast). Whether you like them or not, you can’t get away from flies. Entomologists have described more than 159,000 species in the world, accounting for a staggering 10–15 percent of all the known animals on Earth. And every day we are still discovering yet new species. There aren’t many fly scientists to work on all these flies, so some families have received little attention and it’s in these forgotten groups that we’re making most of the discoveries. In February 2017 alone, I identified more than 100 fly species new to science. At the same time, we’re also losing species at a rapid rate due to harmful human activities like climate change, deforestation and the introduction of invasive species. Here’s why we need to respect and protect flies. Flies give us chocolate. Without flies, there would be no chocolate. The only known pollinator of the flower of the cocoa plant is a teeny-tiny midge fly from the family Ceratopogonidae. These flies are native to the areas where cocoa is traditionally grown and also occur naturally in countries like Brazil, Ecuador, Mexico, Ghana, Nigeria, Malaysia and Indonesia, where cocoa cultivation is relatively new. You could credit the little midge fly with generating $98 billion USD each year, which is what chocolate adds to the world economy. Flies contribute to the global economy in other ways. Some of Australia’s most iconic plants, like eucalyptus or tea trees, are pollinated by hoverflies, horseflies and pesky blowflies; they’re assisted by other insects as well. Overall pollination by insects, flies included, is thought to be worth $6 billion USD each year in Australia alone — or a staggering $250 billion USD worldwide. Flies are a huge driver of the economy, but we take them for granted. Flies are fast — like leave-Usain-Bolt-in-the-dust fast. The scientific name for flies is Diptera, Latin for “two wings.” All diptera have one set of wings; they also have aerodynamic counterbalancers known as halteres, which allow them to zip and dive at great speeds. Flies are among the fastest insects in the world: the horsefly has been clocked at up to 55 miles per hour. Compare that to relative slowpoke Usain Bolt, who managed only 28 mph at the Olympics. They add beauty to our world. Really. Some flies are downright gorgeous. 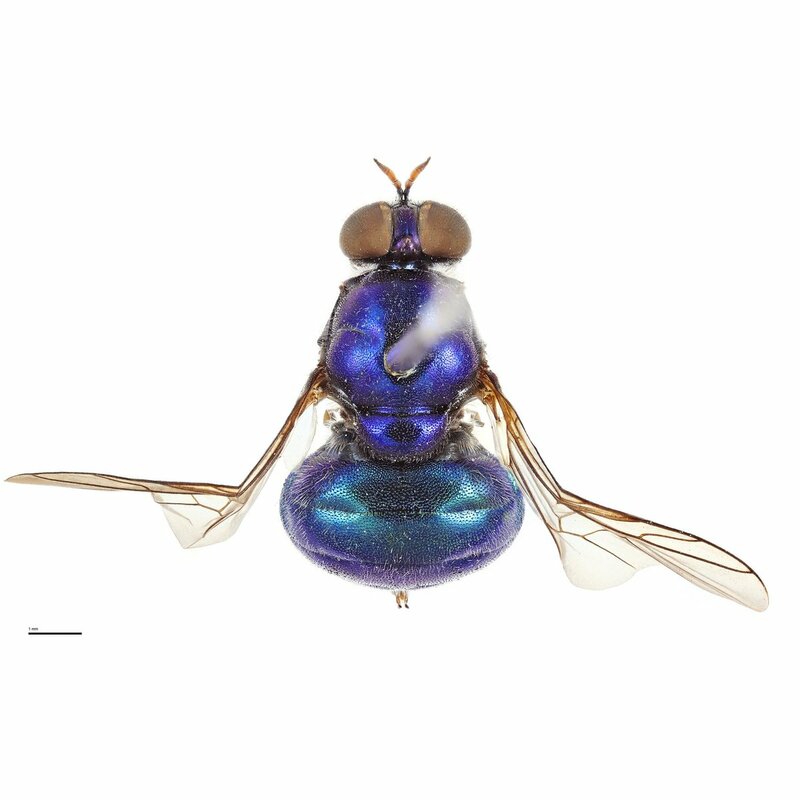 Take, for instance, the Lecomyia notha soldier fly from Queensland, Australia. Its exoskeleton is shining purple, and I think it looks like an opal galaxy. A few years ago as part of my PhD, I was in the Australian National Insect Collection in Canberra and going through some of its 12 million insect specimens. One with a bright, golden rear end — which is actually its abdomen — caught my eye. Because I happen to work on that group of flies, I knew it was a new species right away. I named it Plinthina beyonceae, after Beyoncé. Fly larvae have tremendous healing power. With concerns of bacterial resistance on the rise in recent decades, medical professionals looking for an alternative method of treating gangrenous wounds without antibiotics have turned back to the past — and began reintroducing maggot therapy. First recorded in use in the 1500s, maggot therapy helps manage diabetic ulcers, bedsores and other wounds through applying larvae of Lucilia sericata, commonly known as the sheep blowfly, to a patient’s infected area. The larvae eat and dissolve infected tissue, effectively cleansing a wound and speeding the growth of new tissue. This therapy occurs under supervision — a nurse monitors the progress of the wound and when there is no more dead tissue left and the larvae are full, the maggots are collected by the nurse. Today maggot therapy is used in the US, Europe and Australia, and it’s estimated to save $1.9 billion USD a year in the UK. And they’re tremendous composters. I like to call maggots the original hipsters — they eat only organic and love to recycle. Larvae can consume any sort of organic waste and convert it into essential nutrients that can be used by other plants, animals and organisms. Not all species of flies compost equally. The most effective composters are the blowflies, flesh flies, bush flies and soldier flies. Think of it this way: if we lived in a world without flies, our streets and parks would be full of dead animals, rotting leaves and logs and nasty surprises left by dogs. Researchers in Costa Rica have fed organic household waste to larvae of the black soldier fly, Hermetia illucens, and found the maggots reduced the waste by up to 75 percent. One female can lay up to 620 eggs — creating a small army of recyclers — and each larva can eat half a gram of organic matter per day. As a result, some innovative companies are attempting to harness the composting might of black soldier fly larvae in order to divert commercial and household food waste from landfills. The larvae are hardy; unlike most hipsters we know, they can tolerate putrid, hot and acidic conditions, and still pupate into healthy adults. Flies may be the next superfood — but you won’t taste a thing. Although the black soldier fly was first described as a species in 1758, we’re only discovering its many potential uses now. In 2050, the world is expected to contain 9.6 billion people, and we’re expected to feed them with the same amount of resources we have today. Here’s some food for thought: Could we harness the power of flies to feed this growing population? I’m not suggesting we start putting handfuls of larvae or flies in our stir fries or burgers. But perhaps we could feed them to our pets or farm animals. This process is already under way. Scientists are transforming the black soldier fly into a rich, sustainable and nutritious meal for livestock. The larvae are 45 percent protein — they’re like wiggly little protein bars. Black soldier fly feed has been found suitable for the diets of chickens, prawns, fish, pigs and even alligators. Research has shown there are no negative impacts on the animals eating this feed, and some chickens actually preferred it and grew larger on black soldier fly feed. Trials have also found that human customers couldn’t tell the difference in the taste or aroma of products fed by black soldier flies. We currently use half the world’s arable land to grow crops like soy and corn to feed animals, but black soldier flies require a much smaller footprint and could be grown in warehouses. How amazing would it be if we could return this land to nature and rehabilitate it, or use it to grow crops for humans? Flies could someday power our cars. There’s another amazing experimental use of the black soldier fly, which is one of the species I study: researchers have been able to extract oil from its larvae and turn the liquid into a form of biodiesel. Imagine going to your petrol station and filling up your car with fly biodiesel — or as I like to call it — fly-o-diesel. By sharing with you the wonder, beauty and utility of flies, I hope that you might begin to see them as an important part of our world’s biodiversity. There are many ways you can support them: visit science museums or other museums with insect collections; start a citizen science program; or create a digital insect collection by going outdoors, photographing specimens, and going online to identify them. You might just find the next Beyoncé fly. At the very least, the next time you eat a piece of chocolate, remember to give thanks for flies. Bryan Lessard is an entomologist, researching flies, and a postdoctoral fellow at the Australian National Insect Collection at CSIRO in Canberra.